Ella Lister covers all the bases of the third quarter in the wine-auction world, including news of the most expensive bottle ever sold. Summer is always a quiet time for fine wine, and 2018 was no exception, but September was a healthy month. Primary releases on La Place de Bordeaux marked the red-trouser rentrée for the wine trade, starting with Opus One 2015 on September 3. Next came Italian and South American offerings such as Masseto 2015 and Almaviva 2016, and then some home-grown releases in the shape of Les Forts de Latour 2009 and Yquem 2016 to round off the month. This spate of mainly non-Bordeaux releases in September has become a key moment in the fine-wine calendar, and it serves as a mini model of how organized and efficient the Bordeaux Place can be at its best, with release dates and prices decided well in advance. The back-to-school activity helps quickly reenergize the fine-wine market as a whole, ready for the crucial fall and holiday season. 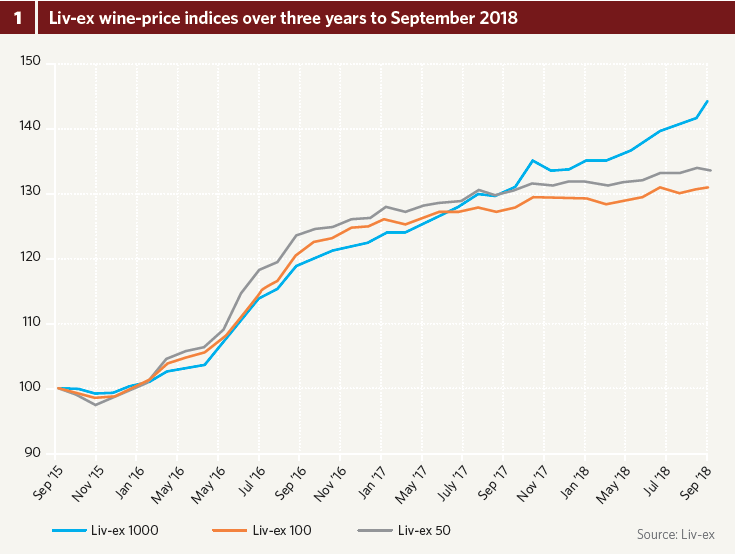 Nonetheless, the third quarter of 2018 saw fine-wine prices stagnate at the top level (fig. 1). The Liv-ex 100 and Liv-ex 50 indices were both flat over the three months to September. Meanwhile a broader index, the Liv-ex 1000, continued its acceleration away from the pack, gaining 4 percent. In the 18 months between September 2015 and March 2017, the three indices tracked one another closely. The weak pound following the Brexit vote even favored the more expensive first-growth Bordeaux making up the Liv-ex 50. 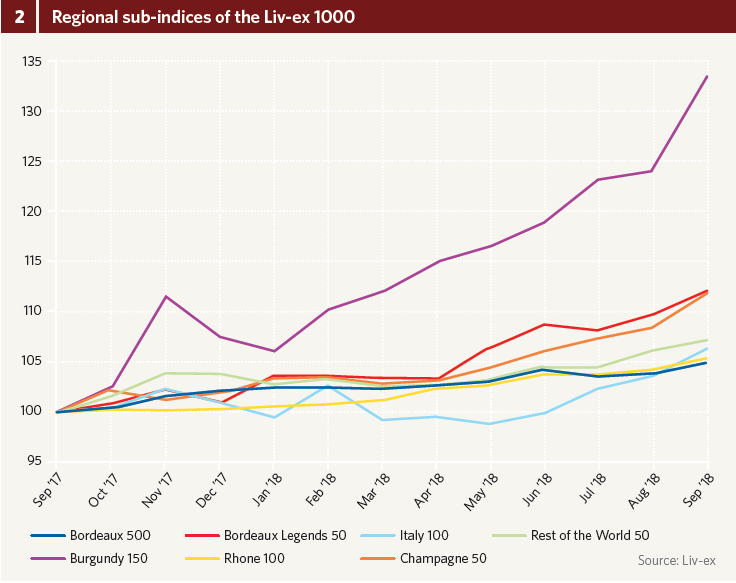 Then the pattern changed, and for the next 18 months, the more varied selection of wines making up the Liv-ex 1000 has continued to gain value, overtaking its narrower siblings. In the 12 months to September 2018, it grew more than four times as quickly, gaining 12 percent (fig.1). Looking into the regional sub-indices of the Liv-ex 1000, it is clear that Burgundy remains the primary driving force (fig. 2). The region’s top wines gained 33 percent over the 12 months to September. Next in line are Champagne and older Bordeaux vintages, growing 12 percent apiece. The remaining regions all gained less than 7 percent over the 12-month period. This includes the Bordeaux 500, which grew by 5 percent; it is a broader index than the first-growth-comprised Liv-ex 50, which gained 3 percent over the same period. Burgundy was also a major driver of success at auction. Global live wine revenues in the first nine months of 2018 totaled $334 million, a 45 percent increase on the same period in 2017. The continent with the largest year-on-year increase was Europe, whose revenues doubled thanks to the second-quarter auction of Henri Jayer’s personal collection by auction-house Baghera for around $35 million. If we exclude this exceptional result, European wine-auction revenues were up just 10 percent on the first nine months of 2017, and global revenues up 30 percent. That is still significant growth, and it is entirely down to an increased average lot price (up by 46 percent on last year including the Jayer auction, and 31 percent excluding it). Otherwise, the statistics are remarkably similar, with just under 72,000 lots sold at 83 auctions over the first nine months of 2018, compared to just over 72,000 lots at 82 sales in the first nine months of 2017. Meanwhile, Asia (or rather, Hong Kong) experienced the largest like-for-like growth, with revenues up 57 percent, and the US grew by a solid 20 percent. Chicago was the main driver for US growth, with California locations also seeing impressive growth, though from a lower base, while New York revenues were down 4 percent. The makeup of revenues on different continents is highly diverse. The US and Asia have similar total revenues per sale, but the average lot price in Asia is 90 percent more than in the US, which in turn has 75 percent more lots in each sale. In other words, Asia has the highest lot prices but small sales, while the US has the largest sales and middling lot prices. Europe, meanwhile, has the least expensive lots at the smallest sales. Europe has only a few more lots per sale than in Asia, and its average price per lot is almost 50 percent and 75 percent less expensive than in the US and Asia respectively. Sotheby’s maintained its second-half lead to the end of September. This time in 2017, Acker Merrall & Condit was in the top spot, but its respectable growth of 21 percent year-on- year was no match for Sotheby’s 52 percent growth. Likewise Hart Davis Hart beat Zachys into third place compared to the first nine months of 2017, with growth of 51 percent to Zachys’ 29 percent. On September 15, Hart Davis Hart held its largest auction ever, and the largest commercial wine auction since 2016, bringing in $16.7 million over three days. Baghera is a new entry, and Christie’s is the only major wine auction house to end September below its equivalent 2017 level, with revenues 18 percent down. While Christie’s maintained its sixth place, Bonhams made up significant ground, growing its revenues by 94 percent year on year to $13 million, more than half that of Christie’s, where last year it only managed around one fifth of Christie’s sales. Many auction houses cited Burgundy in general and Domaine de la Romanée-Conti (DRC) specifically as the impetus for their successful third quarter. For example, Acker Merrall & Condit’s auction on September 23 in Hong Kong was “about as high-powered a sale as we’ve ever had,” declared chairman John Kapon, citing an average lot price of around $12,000. He concluded, “We can thank Domaine de la Romanée-Conti for that!” Unusually, 15 percent of revenues were derived from buyers outside Hong Kong, namely from Japan, Taiwan, and America. Heritage, however, attributed a successful September auction to Petrus, which made up the top six lots, including a 12-bottle case of 2000 selling for $51,660. At $4,305 per bottle, that might seem indulgent, but it’s less than one hundredth of the price of the most expensive bottle of wine ever sold, the following month. At the beginning of the fourth quarter, on Saturday October 13, DRC continued its unstoppable rise, when Sotheby’s broke the world record for the most expensive bottle of wine ever sold—not just once, but twice in one auction. Two separate bottles of DRC Romanée-Conti 1945 sold for $558,000 and $496,000 respectively. The same sale also set a new record for the world’s most expensive magnum, with three 150cl bottles of DRC Romanée-Conti 1937 each selling for $310,000. Similar to the record-breaking Jayer auction from the second quarter, this sale was all about provenance. The unprecedented collection of DRC came direct from the personal cellar of Robert Drouhin, who, with his father Maurice, acquired the wines direct from the domaine, largely during the period when they were the exclusive distributors of DRC in France and Belgium. The wines, ranging from 1937 to 1964, totaled $7.3 million, more than five times the high estimate for the auction as a whole. This will contribute nicely to fourth-quarter revenues, which will be analyzed in more detail in the next issue of Liquid Assets. Incidentally, the average lot price was $24,842; double that of Acker’s above-mentioned DRC-dominated auction. For the complete version of Liquid Assets, please refer to Issue 62 of the print magazine.